TL,DR: GM Part 95259816 is not an exact fit in the Spark EV. The driver's mat requires some modifications to fit perfectly, but otherwise the kit fits pretty well. 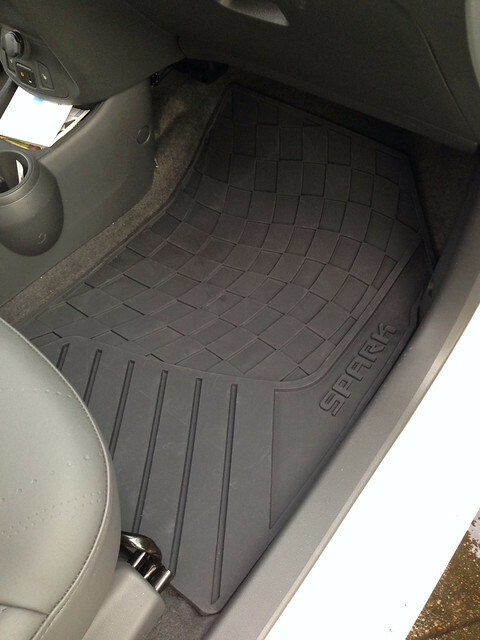 Long version: I recently ordered and installed GM part number 95259816 (2014 Spark Floor Mats - Front and Rear Premium All Weather, Black). These are not listed as being compatible with the Spark EV, but I wanted to try it out and see how far off they were. 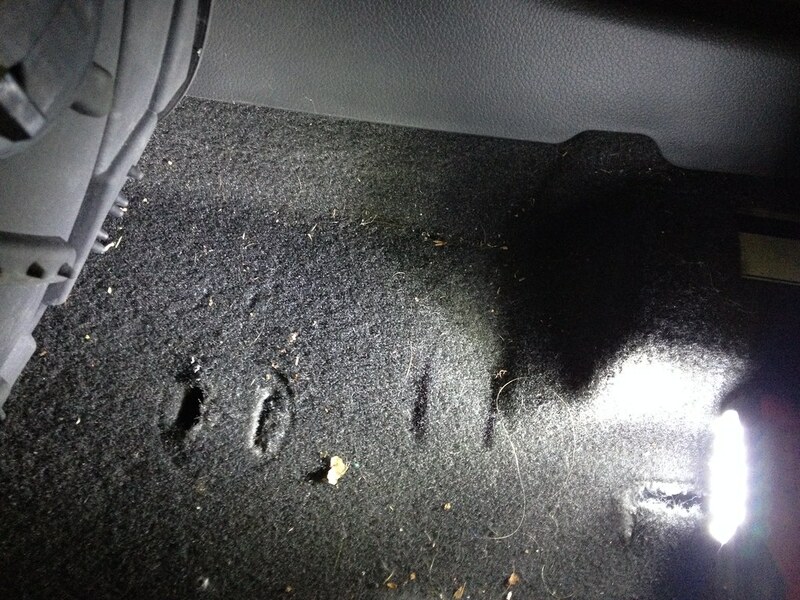 My wife and I are kind of silly about keeping the carpets clean, and with a small investment with a new car you can basically guarantee the original floormat will stay nice for the life of the vehicle. 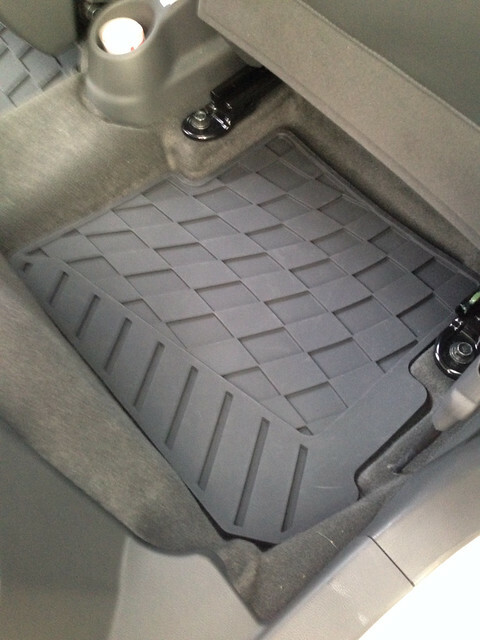 Generally speaking, I prefer factory offered floormats as they offer superior fitment. As a bonus, these GM mats have a checkered-flag type pattern...which would be absolutely silly for the normal Spark, but kind of makes sense for my EV racer, so I don't mind the pattern. On to the facts. It took about a month for me to receive the parts from the time I ordered them because they were backordered at the time, of course I have no idea if this is typical or still the case. I paid about $110 for the complete set including shipping. 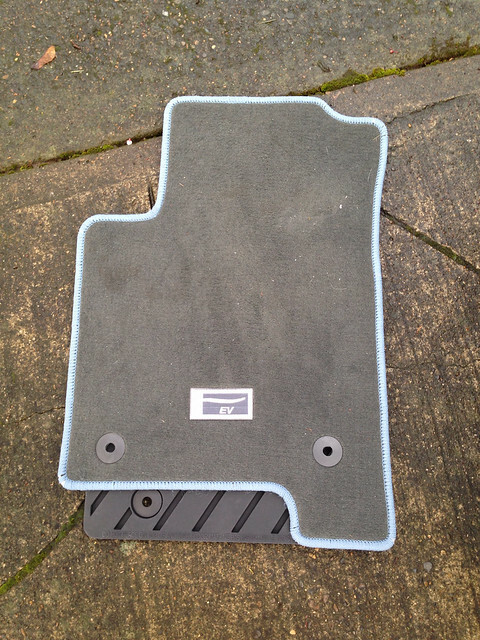 The all weather mats weigh about 10 pounds for the complete set compared to about 5 pounds for the original carpet mats. 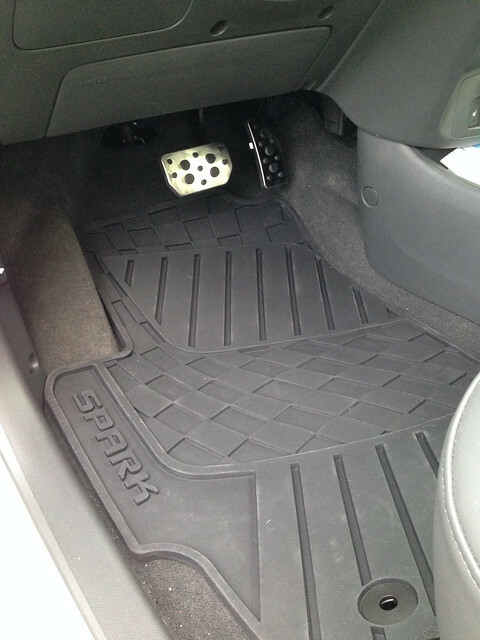 The floor mats in the kit are all exactly the same shape as the stock Spark EV floormats EXCEPT for the driver's mat. The driver's mat interferes with an electronic module that is under the seat and also isn't able to use the factory hold down locations! 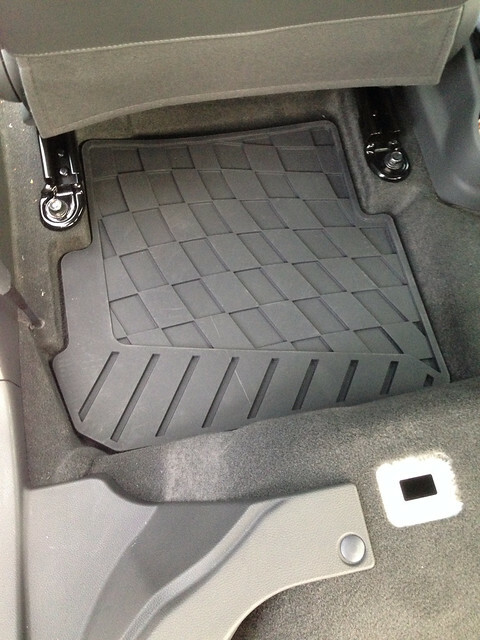 This is important to note, as these hold downs are what keep the floor mat from sliding forward and interfering with the driver controls (pedals). Also interesting to note is that the non-EV floormat has a cutout by the door sill that is where the fuel door latch would be on ICE vehicles. 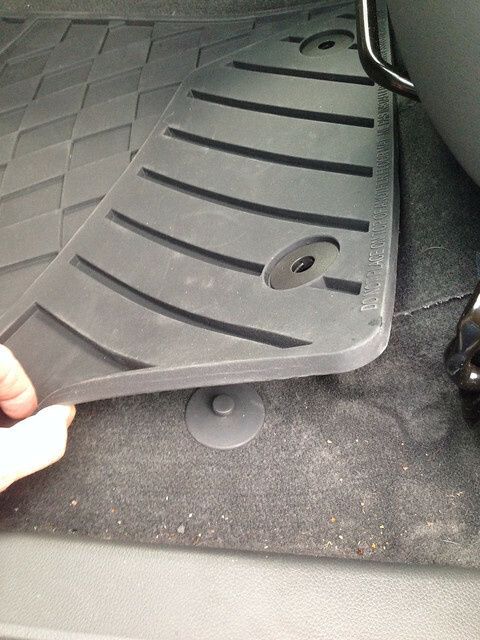 I haven't modified the new driver's floormat yet to duplicate the shape and attachment location of the original floormat. 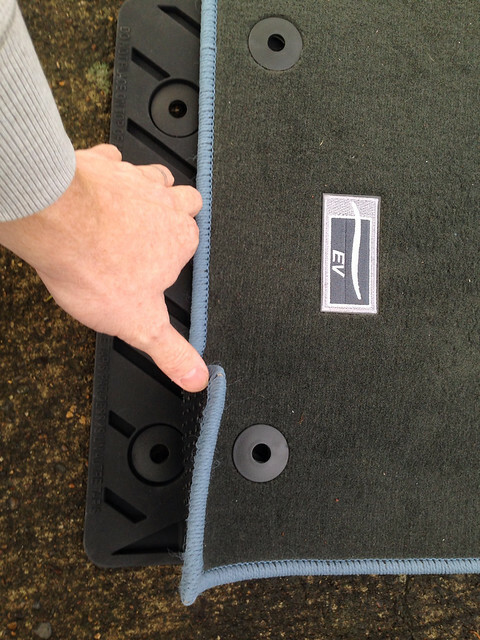 I plan to do this soon and document what minor changes are required to make it work for those who want the fit to be just like the original carpet mat. I just purchased a few days ago, they had mats listed for the EV specifically. I ordered them under the purchase, haven't come in yet. 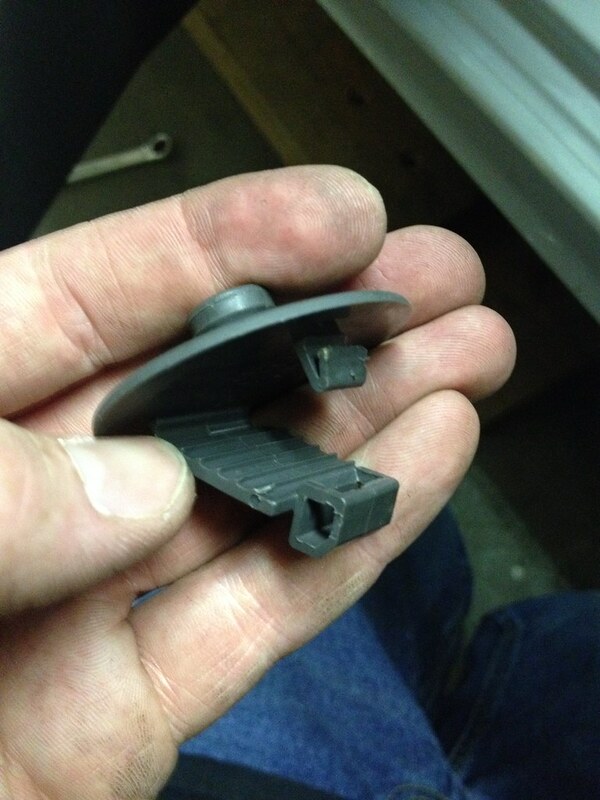 If they don't fit the driver side, I'll let you know, otherwise I can post the part number. I have the same mats. 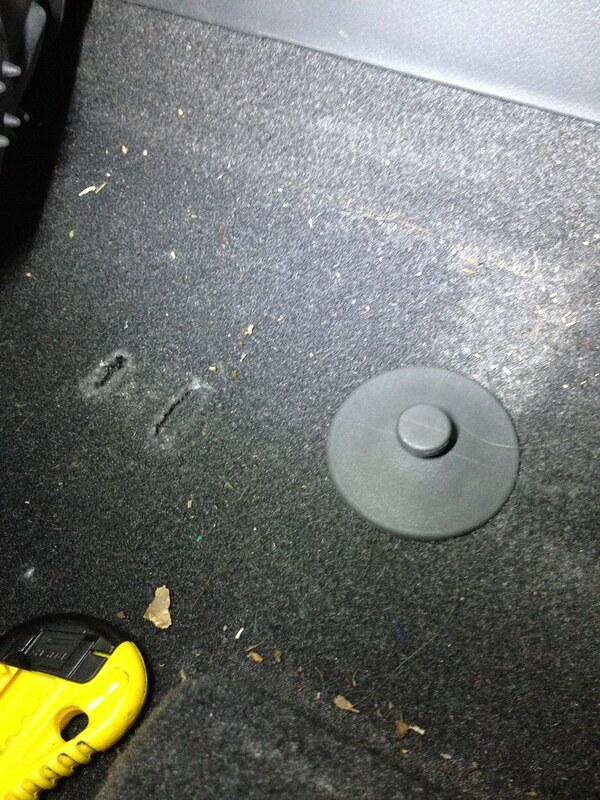 I thought I might mod the drivers side mat at some point but now it is working to keep the outside off of the carpets. The other three mats are exact fits. I have the cargo mat too. It sort of fits but appears to need trimming. I have it tight against the rear seat back with the excess climbing up up the door opening. The end to trim would appear to be the "rear" or door end so one could still get into the 120v charger storage. 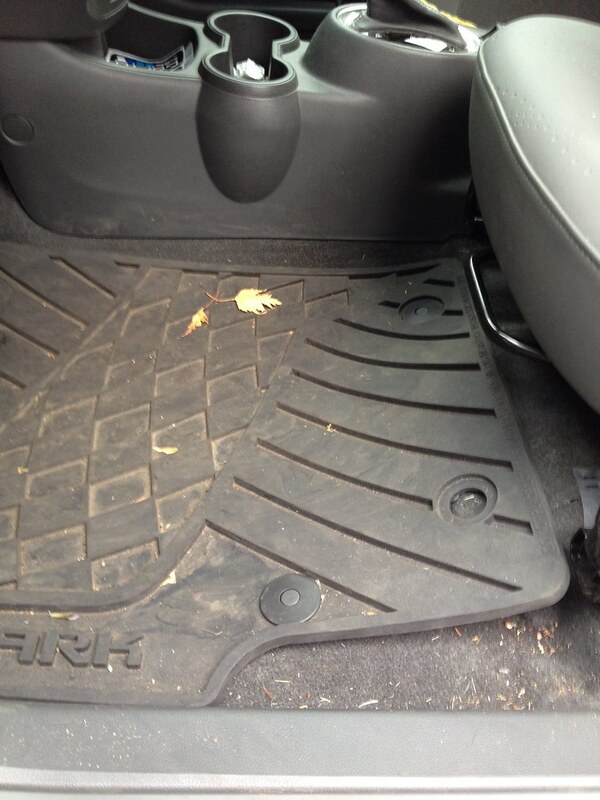 Skullbearer wrote: I just purchased a few days ago, they had mats listed for the EV specifically. I ordered them under the purchase, haven't come in yet. If they don't fit the driver side, I'll let you know, otherwise I can post the part number. Any update? 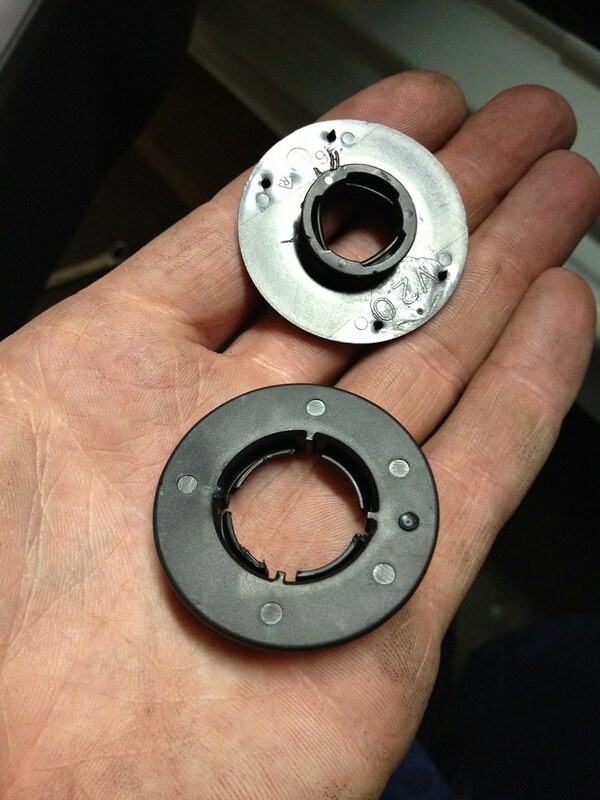 I was expecting to hear back that you had either the same parts as me or the duplicate carpet part number. I'm getting tired of my rigged setup and I'm about to permanently modify them, but figured I'd ask before cutting. 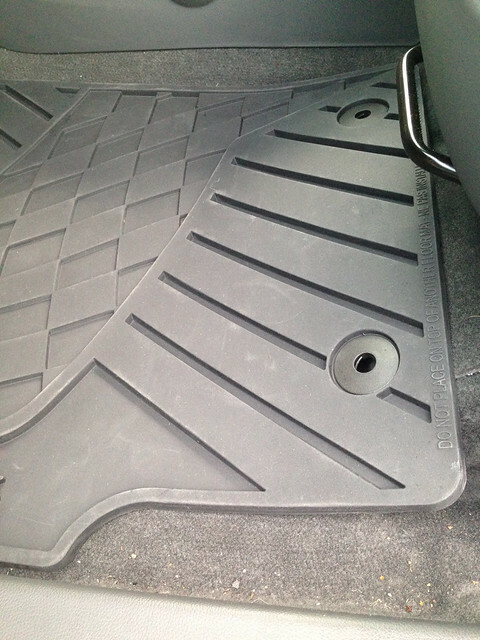 I have never bought floor mats from a dealer. Over priced and never a great fit. I always bought an aftermarket set. In my truck and SUV I just bought a rubber truck set and trimmed where I wanted it to be. Out of curiosity how much are the mats? 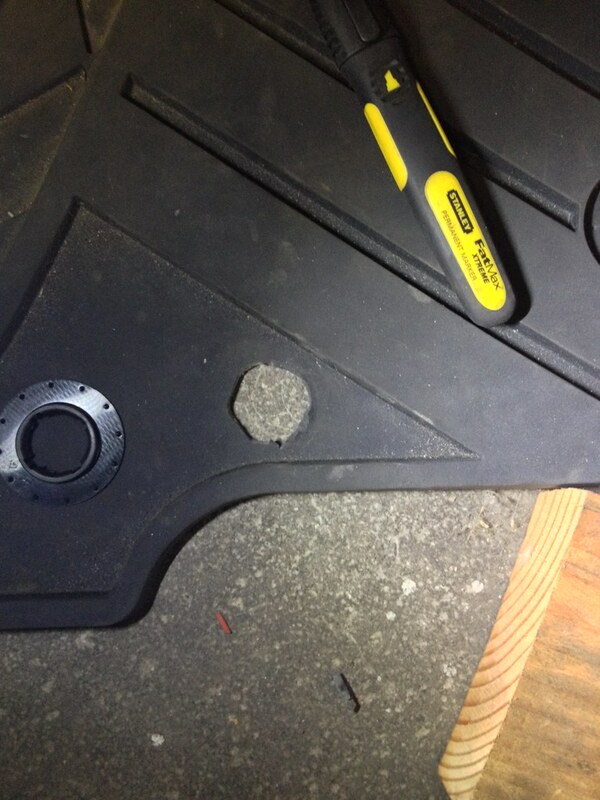 I finished attaching the driver's mat to the carpet (so it won't slide around, an obvious potential issue). It took about an hour to remove the clips, make some modifications to the mat and carpet, and reattach everything. It's now extremely snug and stays put just like the factory intended. This required relocating both clips on the driver's mat. I relocated the clip closest to the door by making a new hole in the mat itself and relocating the female clip as well as moving the male clip on the carpet. The female clip in the mat is a bit tricky, but with a tiny flathead screwdriver I could disengage the retaining clips and split the two halves. The male clip is a little easier, as it only has one tang that needs to be defeated to open the butterfly clip and remove it from the carpet. Clearly, a picture is worth a thousand words here! Once that was complete, you can see in the photos where I made a new small, round hole to install the female clip into. I used a sharp knife and just cut it free hand (CAREFUL!). I then inserted the male clip in this newly located female clip, put the mat in place, and used this to mark the carpet where new slots needed to be installed. I cut two small slits in the carpet with a sharp knife (CAREFUL! ), same size as GM did originally, then slide the male clip in and snapped it in place. On the clip that is closest to the shifter, I did not modify the female clip and only moved the male clip. Just as with the other male clip, disengage the retention tang, open the butterfly, and remove it from the carpet. Put it in the female clip, mark where the carpet needs new slits, use a sharp knife (CAREFUL!) to cut two new slits, install the male clip and snap it all together. I forgot to take an "installed" picture, I'll try to get one soon. It looks just like it should, of course. Click! Click! Snaps together nicely. Such a satisfying feeling doing a simple project like this and making things work nicely. It's dirty, but you get the idea (and understand why I want the rubber mats!) 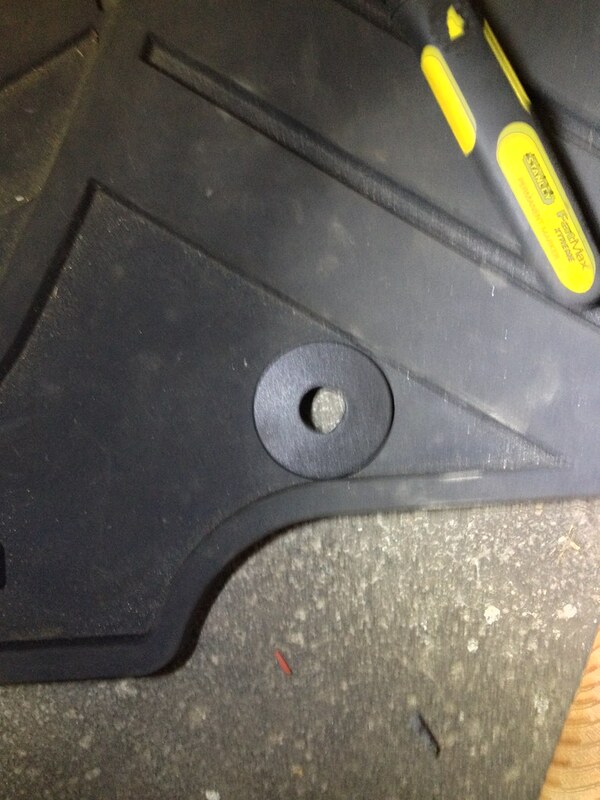 of how the driver's mat looks "finished" after modifications. Bryce, could you have moved both male plugs, not just the one?